American Express Special Offer – Now ON! Use your American Express Card to purchase ANY item from the Pollyanna Pickering Website, and you will recieve a £5 credit on your your next Amex statement! This offer includes Pollyanna’s 2019 calendars (£11.99 P&P FREE) – meaning you can use the offer to purchase a calendar for just £6.99- as well as our full range of books and signed limited edition prints. No promo code needed – just use your Amex card to pay, and the credit will be applied automatically. To take part, you just need to register the offer on your Card – or Supplementary Card – and you’re ready to Shop Small once the offer is live. Simply click the ‘Save Offer to Card’ button below to log in to your online Account and register the offer to your American Express Card. You can do this right up until the last day of the offer which is Sunday 16 December 2018. Details: Lynda Chapman will be live in the studio to launch a brand new papercrafting DVDrom and paperkit featuring a compilation of Pollyanna’s most popular willdife images exclusively on the Create and Craft channel. The show will also feature clips of interviews with Pollyanna. Lynda will be creating lots of card and craft projects to inspire everyone! 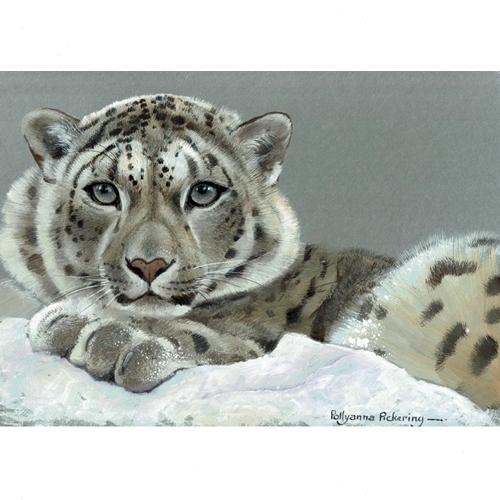 Bid Now for Snow Leopard Painting! In recent years elephants have been killed in Africa for their ivory at a rate as high as one every 15 minutes. That’s 100 a day. An average of three rhinos a day are killed for their horn. To raise awareness of these shocking statistics we asked artists and celebrities to spend the same time – 15 minutes – on a wildlife sketch to support our campaign. The ‘Sketch for Survival’ exhibition now comprises over 160 pieces of artwork, ranging from 15 minute sketches to complex, time-consuming artworks donated by acclaimed professional wildlife artists across 14 different countries. We are also grateful to have the support of so many celebrity sketchers, from Dame Judi Dench and Stephen Fry to Ranulph Fiennes and Ray Mears. Each piece will be framed or mounted and exhibited online, as well as being displayed at the Royal Geographical Society during our Explorers against Extinction event on the evening of 12 October 2017. The purpose of the exhibition is twofold : to aim to raise vital awareness about the threat of extinction to iconic species such as elephant, lion and rhino, as well as raising funds and donating resources to nominated wildlife charities and organisations. All artwork has been donated to raise funds for The David Sheldrick Wildlife Trust (DSWT)and Animals saving Animals (ASA). Profits will be split evenly between them. Every winter Pollyanna opens her private gallery for an exhibition inspired by her love of British Wildlife. This year Pollyanna is staging a very special event to commemorate the 60th exhibition to which she has welcomed people in her own gallery. Visitors can view over fifty original paintings on display to the public for the very first time, in a relaxed and comfortable atmosphere. Pollyanna will be on hand throughout and will be pleased to chat to visitors about her work and the wildlife which inspires her. Among the paintings on display there will be the opportunity to view the study of the Jacob’s Ram which was awarded the Gold Medal for Best Painting in Show 2017 by the Association of Animal Artists as well as the painting of a Barn Owl which was short listed for the Landscape Artist of the Year award earlier this year. mmes featuring Pollyanna live in the studio on the Create and Craft channel! There will be over 150 Christmas card designs to choose from, including the latest charity cards designed by Pollyanna for the RSPB, Guide dogs for the Blind, The Born Free Foundation, Blue Cross and Marie Curie among many others. New fine art calendars of her work will be available for 2018, along with a range of eco-friendly wrapping paper and cards, and even Christmas decorations featuring Pollyanna’s designs! Pollyanna’s Wonderful World Exhibition – Now Open! The exhibition ‘Wonderful World’ is now open in Pollyanna’s private gallery in Derbyshire. the event runs from Saturday 17th June, until 2nd July. Pollyanna will be in the gallery every day to welcome visitors to view her brand new collection of artwork, inspired by her painting expeditions to all seven continents.